A Parliamentary report of 1777 recorded the existence of parish workhouses in Crich (with accommodation for up to 40 inmates), Duffield (20), and Wirksworth (60). Crich's workhouse was erected by the parish authorities in 1734. It was on the edge of the Nether Common before the Common was enclosed. 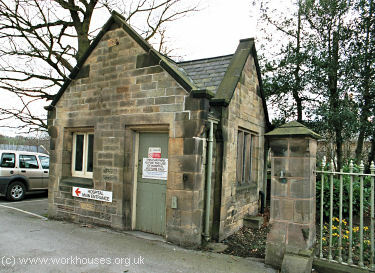 Paupers were sent to the Crich workhouse by several other parishes in the area including Denby, Melbourne, Mercaston, Pentrich, and Willington. The Workhouse is an old building, not originally intended for the purpose; it is not in a good situation, but as far as its construction will permit, kept clean and airy. The following is the weekly diet : Breakfast—Sunday, Wednesday, Friday—Bread and broth; rest of the week—Milk pottage. Dinner—Sunday, Wednesday, Friday—Bread, broth, butcher's meat, potatoes, etc. ; Monday—Baked puddings and treacle sauce; Tuesday, Thursday, Saturday—Bread and milk. Supper—Milk pottage and bread every day. On meat days the proportion is at 20 lbs. meat for 30 persons. The children are kept very clean, and are instructed in their catechism, reading, etc. Few of the inmates are able to work, those who are spin lint, tow, etc., for the use of the house. They are allowed one penny for every 7d. of spinning. The rooms are of various sizes, and contains 2 to 7 beds each. The beds and pillows are filled with chaff, and have 2 sheets, 1 blanket, and 1 coverlet. There are at present 28 persons in the house, 12 under 7 years of age. Subscriptions for the Poor last winter (1794-5) amounted to £60, which were laid out in purchasing coal, beef, and potatoes. The Poor in the Workhouse have oat bread, but no beer or cheese, except at Christmas. A sort of gruel called water pottage, consisting of a small proportion of oatmeal, and a small onion boiled with water, was eaten with bread twice and sometimes thrice a day by many people in this neighbourhood. It was much used during the late hard season. The cost of such a meal was about 1¼d. for each adult. Several small donations, amounting to £45 10s., are distributed yearly among the Poor who do not receive any parish relief. 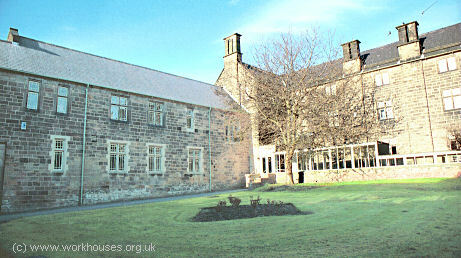 Babington House on Green Hill in Wirksworth once served as the local workhouse. 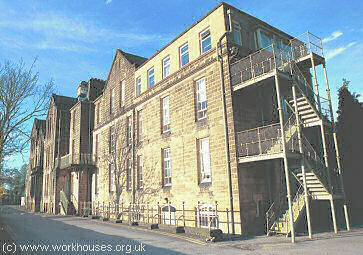 Wirksworth former parish workhouse, 2005. Derbyshire: Alderwasley, Allestree, Ashley Hay, Belper (6), Crich (2), Denby (2), Dethwick Lea and Holloway, Duffield (2), Hazlewood, Headge (2), Holbrooke, Horseley, Horseley Woodhouse, Ideridgehay and Alton, Ireton Wood, Kedlaston, Kilburn, Kirk Langley and Meynell Langley, Mackworth, Mapperley Markeaton, Morley, Pentrich, Quorndon, Ripley (2), Shuttle and Postern, Smalley, South Wingfield (2), Turnditch, Weston Underwood (2), Windley, Wirksworth (4). The parishes of Alfreton, Mugginton and Ravensdale park were added on 30th September, 1837. Later Additions: Milford (1897), Rowditch (1890). The population falling within the Union at the 1831 census had been 33,388 — ranging from Kedlaston (population 134) to Belper itself (7,890). The new Board of Guardians held its inaugural meeting in May 1837 at the Lion Inn, Bridge Street. The priority of erecting new workhouse was agreed upon, with the capacity of the three existing parish workhouses in the Union being inadequate. A report in November 1837 by one of the Union's medical officers highlighted the poor state of medical provision at the time. One of the sick poor, "aged 78, has lain upon a squab in a stockinger's room for the last four months — he was supposed to have had a paralytic stroke, but his case has turned out to be a fracture of the neck of the thigh bone." 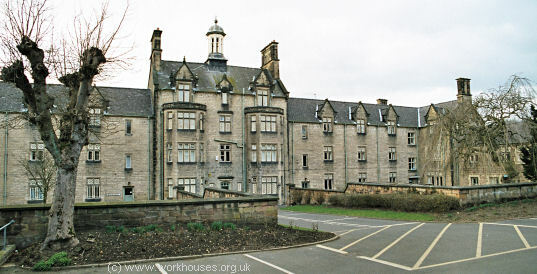 The architects appointed to design the workhouse were the prolific partnership of George Gilbert Scott and William Bonython Moffatt who were also responsible for the workhouse at Chesterfield. Because of changes in the site, and in the architects' design, there were several delays in starting construction. There were also problems during the building work, including the bankruptcy of the building contractors. The building was eventually completed in September 1840 on a 2.5 acre site at Babington Meadow which had been purchased for £750 from local landowner George Benson Strutt. The building was constructed from local Derbyshire stone at a cost of £8,700 and was intended to accommodate up to 300 inmates. The location and layout of the workhouse can be seen on the 1913 map below. Belper aerial view from the south. At the east of the site, facing onto the Derby Road, was the main entrance lodge with a central archway leading through to the workhouse. Belper entrance lodge from the east, 2005. 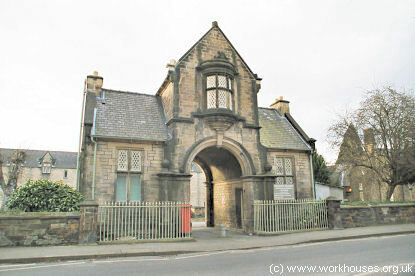 Belper archway lodge from the east, 2005. A smaller lodge was located at the north-east corner of the site. This was later used as a cobbler's workshop where the inmates could get their shoes repaired. A walled path from led from the entrance to the main accommodation block. The walled-off areas to each side formed exercise yards for different classes of inmates. The centre of the main block was four storeys high with three-storey wings to each side, and two-storey cross-wings at each end. 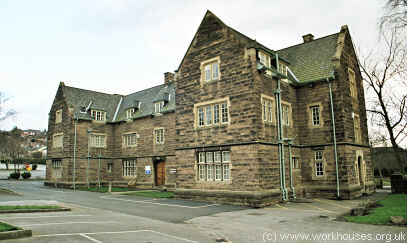 Belper main block from the east, 2001. At the centre rear of the main block was a single storeyed block which probably served as a dining hall and chapel. 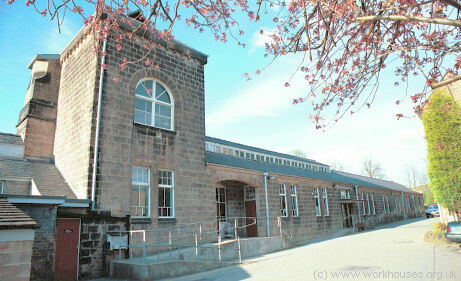 Belper dining hall from the north, 2001. Belper north-west courtyard from the south-east, 2001. A long single-storey laundry block ran along the northern edge of the site. Belper northern block from the south-west. 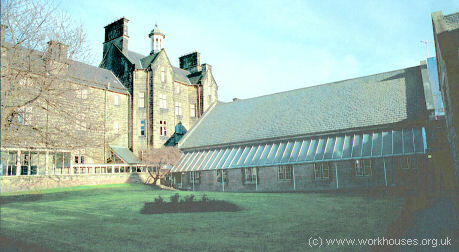 In 1889, a large new infirmary was erected at the west of the site. 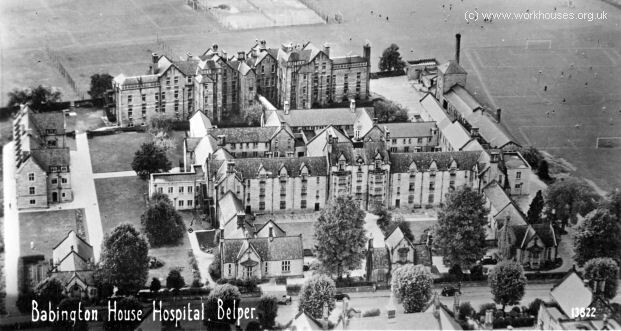 Belper 1889 infirmary from the south-west, 2001. Some time after 1913, a further block was added at the south-west of the site. Belper south-west block from the north-west, 2005. The workhouse inmates provided much of the labour to run the establishment and minimise running costs. Soon after it opened, the weekly provisions bill was around £17 for the 158 inmates. Boy inmates were taught shoemaking and tailoring. Vagrants were accommodated in tramp cells and had to pay for their night's accommodation by breaking stone into pieces small enough to pass through a metal grille. The tramp cells were demolished in 1954 and the stone-breaking grilles donated to Derby Museum. 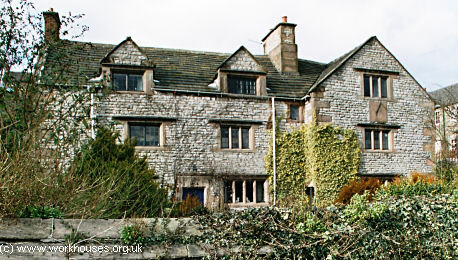 After 1930, control of the site passed to Derbyshire County Council and was became Babington House Public Assistance Institution. Between 1930 and 1941, the council undertook an extensive modernisation scheme. During the Second World War, the hospital participated in the Emergency Medical Services scheme. Following the inauguration of the National Health Service in 1948, the institution was renamed Babington Hospital providing care for 155 geriatric and 16 maternity patients. The Belper Union established children's a cottage home for 30 girls at 50-52 Holbrook Road, Belper, A home for 15 boys was opened at Park Side, Belper. Derbyshire Record Office, New Street, Matlock, Derbyshire. Holdings include: Guardians' minute books (1837-1930); Admissions and discharges (1840-50, 1853-1911); Births (1840-1957); Deaths (1840-1914); Creed registers (1869-93); etc. 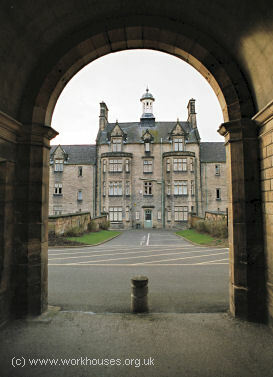 Spotlight on Babington Hospital (Derbyshire Local Studies Centre).